Instagram Stories Can Be Great for B2B - Here's How! Believe it or not, businesses can generate leads through Instagram. Gone are the days when the visual platform was only utilized to share personal photos with friends and family and follow a few of your favorite public figures, sports heroes and celebrities. Thanks to new features such as Stories, Instagram can certainly be utilized for not only B2C but also for B2B purposes. One thing is for sure – people love being invited to view exclusive content. It makes them feel valued and important. Instagram Stories is an excellent way to invite your audience members for an exclusive tour of offices or headquarters, a behind-the-scenes of an event or an unveiling or a new product or service your company will provide. 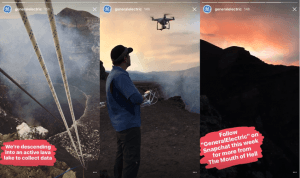 GE utilizes Instagram Stories to share incredible moments that their employees experience – like descending into an active lava lake to collect data. Sure, not every company is risking their lives for information, but there are still plenty of fun and inspiring moments your team will have that your audience will enjoy. Yes, it is possible to convert users through Instagram Stories. First, decide on a clear CTA for social referrals through the “See more” swipe up the function that appears at the bottom of a Story. Then, work backward and decide the best way to drive users to open the link. Is it raising awareness about a specific fact? Is it offering a solution to a common problem your audience may have? Using the bells and whistles Instagram offers, explain the why to your followers and make sure your CTA is a clear “how” to the why. 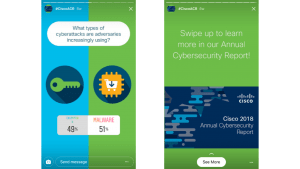 Cisco does an excellent job using Instagram Story polls to promote their Annual Cybersecurity Report by raising awareness, offering a sample of the report, then offering the CTA as a means to view the report in its entirety. Meet the Team: Upload a weekly featuring that highlights a team member. Have them answer a few questions on camera, or allow them to take over the account’s Instagram Story for a day to give the audience insight on their daily job tasks and schedule. Highlight each of these stories to create one long piece that users can view at any time. 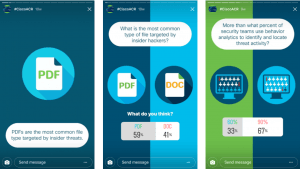 Q/A: Using the questions sticker, allow your audience to ask you any question they want (don’t worry, you get to pick which you answer) and post them to your Instagram Story feed. How-To: Share a tutorial that details how users can perform a task your company does easily such as making a recipe, creating a template (record your screen and upload!) or even packaging items beautifully. Looking to strengthen your brand’s reputation or recruit applicants? Instagram Stories is a great place to offer real, live and genuine proof that your employees are having a blast at work. Take MailChimp, for example, who is notorious for being a fun place to work. They highlight this through Instagram Stories by featuring various employees and showcasing a little bit about their day (and their super-cool desks). Start off small by sharing some of the perks your employees receive such as a coffee bar, donuts on Thursdays or in-house massages. Remember, Instagram Stories disappear after 24 hours – it’s ok to overshare just a little. If you aren’t tracking tags, hashtags and locations tags for user-generated content, you’re doing it all wrong, here’s how to find the perfect hashtag. Chances are, your audience members are tagging your brand in Instagram Stories each day. Whether it’s sharing a photo of your product, thanking you for a template, or simply sharing their customer experience, this is excellent content for you to share on your own Instagram Story feed. Sharing these will demonstrate to your audience that interact with and highlight mentions – leading others to tag you in content, too. Its an excellent way to build brand awareness and really shows your brand is invested in the community it’s building. Don’t forget to highlight them so people can view them forever! What brand’s Instagram content do you appreciate the most?